Squatting is a foundational movement that most adults have lost the ability to perform. A big reason people end up needing to be cared for later in life is the loss of strength, power and mobility in the hips. Most of us will bend forward in the spine to pick something up off the ground instead of hip hinging and squatting. Over time this can be detrimental to our spines and can create long term issues. We should be squatting and deadlifting throughout the day to create healthy patterns. Most people will say "my squat is terrible" but will not spend time on fixing it until there is a big enough problem present - back pain, degenerative disc disease, bulging discs, etc. Test your squat today and get to work now! To test your squat, stand with your feet about shoulder width apart and your toes pointed straight ahead or slightly turned out. Sit back and down like there is a chair behind you, make sure your knees stay in line or slightly outside of your feet. Try to get your upper leg parallel with the floor, keeping your shins fairly vertical and your heels on the floor. 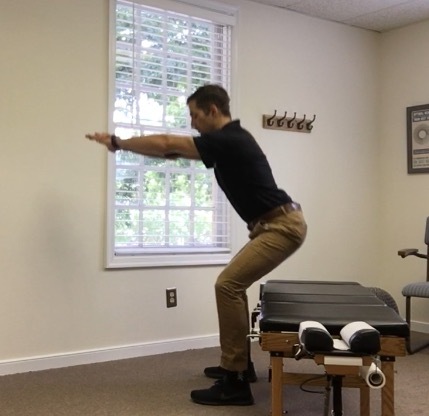 The main things you want to accomplish are 1)maintaining control of your spine the entire movement 2)break at the hips first 3)keep your shins fairly vertical 4)keep your knees in line or outside your feet as you descend 5)can you get close to or beyond parallel (hip below knee). Number 5 is the least important if you are just trying this or starting out. You can put a chair/box/ottoman behind you (as pictured) to use as a target to get your hips back and down and help focus on the first 4 steps. Get the pattern down! Don't go lower until you can master them. Be patient! Newer PostPicking something up from the ground aka the deadlift.